Better hop to it. The sun is shining, the birds are singing, and Easter is right around the corner. 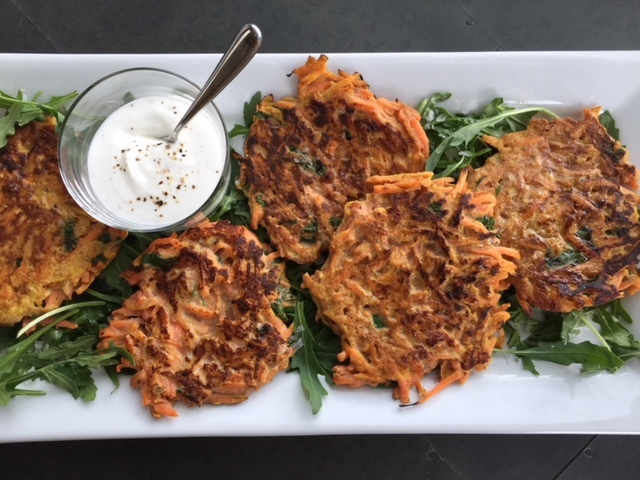 Carrot pancakes are a fun way to add something new and different to your brunch line-up. These vegetarian fritters are part pancake, part latke and dare I say a bit falafel-like. Thanks to the addition of chickpea flour they are also gluten-free. Best of all, you can get a jump-start on your holiday and make them ahead; they reheat well. If you buy your carrots already grated, you just need to crack the eggs and add the cilantro and the flour. Or, you can spend the better part of your morning searching for the parts to your food processor, which in my case has more working components than the space shuttle. I spent a lot of time with a flashlight, in a pose I normally reserve for yoga, searching for a clear plastic cylinder which I discovered after much time was not in the cabinet, but had rolled onto the floor. I was, however, elated to discover just which lid fits with that blade attachment. This had puzzled me for a long time. I made my pancakes a bit smaller than the original recipe, which used a 1/2 cup measure. This smaller size was easier to manage and you should be able to cook about 2 at a time, depending on the size of your skillet. If your skillet is well seasoned, you can get by with very little added oil; using it mostly to keep your pancakes from sticking, rather than for frying them. Super easy. Just a few ingredients, and if you’re not grating carrots, hardly any time and effort required. Leaving you with plenty of time to smell the flowers, tend to that spring gardening, and hard boil a bazillion eggs. Combine eggs, carrots, cilantro and chickpea flour in a large bowl and mix (mixture will be loose). Season with kosher salt and freshly ground black pepper. Heat 2 tablespoons oil in a large skillet, preferably cast iron, over medium-high heat. Using 1/3 cup measure, scoop carrot mixture into skillet and press to 1/2” thickness. Cook until golden brown, about 3 minutes per side. Transfer to paper towel lined plate. Repeat, adding more oil to skillet, if needed. Season yogurt with salt and pepper. Plate greens and drizzle with olive oil and lemon juice; season with kosher salt and freshly ground black pepper. Top greens with carrot pancakes and serve with salted yogurt.